Hello, my name is Kira Tisbury and I am one of three young associates at Theatre Royal. As a young associate, I get to work within different departments of the theatre getting hands on experience in learning what it takes to make a busy arts venue operate. I will be recording my experiences throughout my time as a young associate in blog posts to give you a greater understanding of what happens behind the scenes and hopefully help future young associate’s decide if it’s right for them. My first post is about my experience of this year’s pantomime, Sleeping Beauty. Now that Sleeping Beauty has come to a close, it’s great to look back at what a brilliant panto we created. 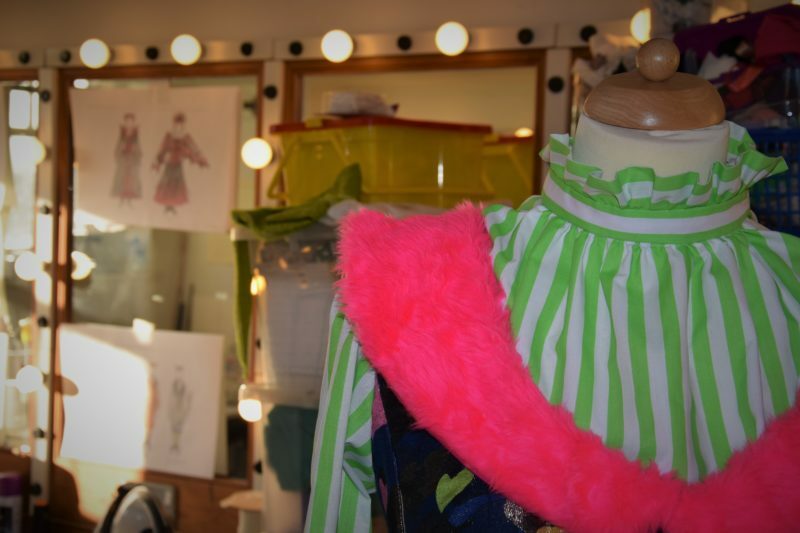 The costumes for panto are produced in-house, and I was lucky enough to have the chance to work with the wardrobe department on the creation of them. The panto costumes have to survive the full run of 76 shows, still looking as great as they did at the start; with a cast of fifteen and many costume changes this was a big task. I joined wardrobe at the end of October and the process was well under way, the costumes had been designed and the fabrics were chosen. This was a really exciting place to join as I experienced the sketches come to life and turn into costumes. Working alongside Heidi (Wardrobe Supervisor) I was set many tasks to help create the beautiful costumes that were seen on stage. These included sewing on flowers, overlock various dresses and tunics, sewing on buttons and poppers, and lacing many belts and sleeves. Overlocking was a new skill I gained during this process. An overlock is a kind of stitch that sews over the edge of one or two pieces of fabric for edging; it creates finished seams neatly and quickly. The overlock machine is something I had never used before but was an essential part in making the costumes. Not only did I get to be a part of creating the costumes but I also got to experience how much love and hard work goes into creating such a vital part of panto. Blue stripy shirt and blue dress. Nanny Fanny had the most costume changes in Sleeping Beauty; lots of which were quick changes. This meant that when creating the costumes, they had to be easy to put on and take off. 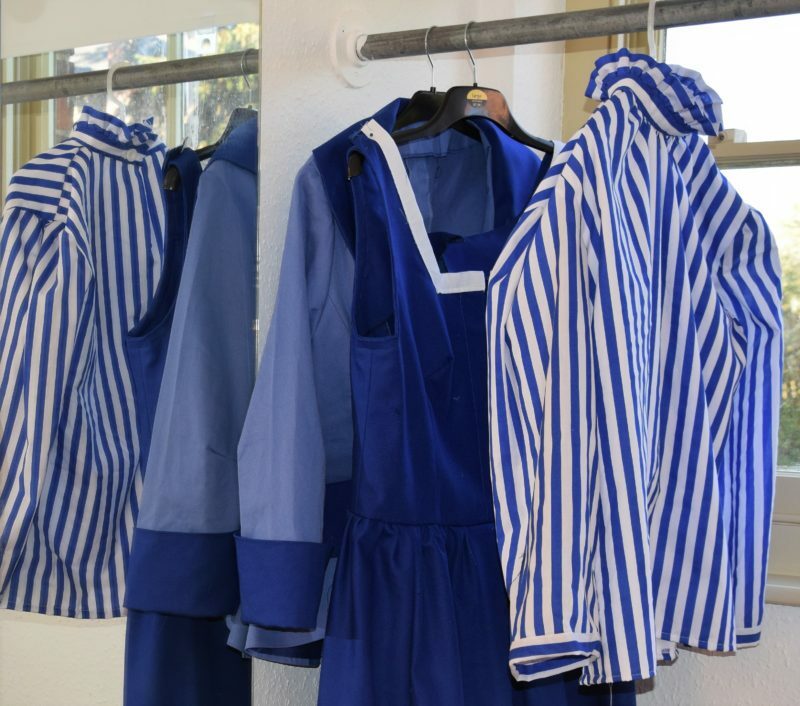 This resulted in single items being sewn together to make one piece, such as the blue stripy shirt and blue dress. These dresses took the longest to make but it was so rewarding to see how brilliant they looked on stage. There was also the mission of creating costumes for animals, bats and even a dragon; a challenge that was taken in the wardrobe teams’ stride. Who knew that milk bottles could make such brilliant bat ears? Watching the panto from the audience it was brilliant to see how the costumes looked on stage and helped tell the story. All the hard work, numerous costume fittings and trips out for supplies really helped make such a successful show. I look back on the experience with such joy, the love for panto throughout the theatre from cast, crew and audience is infectious and something I’m so grateful to have been part of. Turner's of Great Barton Save the Day! Meet The Volunteer Walkers: Chris Clarkson!